The spies return from the land of Canaan, and report to Moses what they saw. HEN THE CHILDREN of Israel were encamped in the wilderness of Paran, Moses, by God's command, sent twelve men, one from each of the twelve tribes, or families into which they were divided, into the land of Canaan, that they might bring him word what sort of country it was, and what kind of people lived in it. 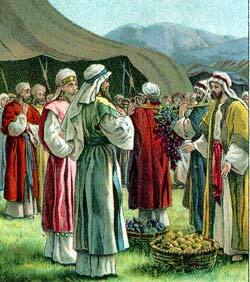 He also told the men to bring back with them some of it's fruits. So the twelve men, who are called spies because they went to see the country, went, and were out forty days. When they returned, as it was the time when grapes were ripening, they brought with them, from Eshcol, a bunch of grapes, so large and ripe that two of them carried it between them. This, and other fruits that they had gathered, they showed to the Israelites, and told them that the country whence they came was very fertile, but that the people in it were so powerful and warlike that it would be impossible to drive them out, as God had said they should. They were giants, and lived in large cities, defended by walls. And though Caleb, a brave man, one of the spies, wished that the people should at once march forward and take it, the other spies repeated that it was impossible. Then the people began to reproach Moses and Aaron for bringing them into that wilderness to be slain by their enemies; and they threatened to put Moses away from them, and choose, in this place, a captain who might lead them back into Egypt. Caleb, and Joshua, another of the spies, entreated them not to rebel against God; for, if they obeyed Him, He would certainly, as He had promised, give them that rich country. But the multitude only clamored the more, and were even for stoning Moses and those with him. Then suddenly the glory of the Lord was seen in the Tabernacle; and God Himself, in His displeasure, declared that as the people would not believe him, they should no longer be His people, nor have the good land He had promised them. But Moses again prayed earnestly for the rebellious Israelites, begging God to pardon them. And God heard his prayer, and said that He would not entirely cast them off. But that none of those men, for whom He had done such great things, in delivering them out of Egypt, and feeding them in the wilderness, and who had yet constantly rebelled against Him, should enter into the promised land: they should all die in the wilderness. Only their children, together with Joshua and Caleb, should be brought into Canaan.